Background CMIS techniques are heavily dependent on placement of lateral interbody cages. Cages with an increased lordotic angle are being advocated to improve segmental lordosis and SVA. We assessed the segmental lordosis achieved with the individual cages. We further studied three variables and the effect each had on segmental lordosis: the lordosis angle of the cage, the position of the cage in the intervertebral space, and the level that it has been placed. Methods This is a retrospective study of 66 consecutive patients who underwent lateral interbody fusion using lordotic cages as part of CMIS correction of scoliosis from June 2012 to January 2016. Standing radiographs at pre op and 6-week follow-up were reviewed to identify the position of the cage in the intervertebral space and the amount of segmental lordosis achieved. Results A total of 224 cages were placed. The 6°, 10°, 12°, and 20° cages achieved a mean segmental lordosis of 9.00°, 13.09°, 13.23°, and 18.32°, respectively (P < .05). Additionally, cages placed in the anterior, middle, and posterior 3rd of the disk space produced 13.02°, 11.47°, and 8.23° of lordosis, respectively (P < .05). Stratifying by level, cages placed at T12-L1, L1-2, L2-3, L3-4, and L4-5 translated to mean segmental lordotic values of 8.43°, 10.02°, 11.38°, 12.91°, and 14.58°, respectively (P < .05). Conclusions The angle of the cage had an impact on segmental lordosis. Achieved segmental lordosis was notably more when the cage was placed in lower lumbar levels. Additionally, cages placed in the posterior 3rd of the intervertebral space had significantly worse segmental lordosis compared to those placed in the anterior or middle 3rd. Our study shows that an average delta change of 8.03° can be achieved with 12° cages and this when done at each subsequent level results in a progressive harmonious creation of lordosis. IRB approval was obtained for this study. Novel innovations have been introduced to tackle the problem of sagittal alignment. These include anterior column realignment (ACR),34-41 rod contouring,42,43 and the utilization of hyperlordotic cages.34,38 These are designed to maximize the sagittal correction achievable with CMIS techniques while maintaining the many benefits that MIS operations offer. Although they show promise, the efficacy of these new approaches has not been well studied. Our analysis focused specifically on the use of hyperlordotic cages. It is known that angled cages improve lordosis and subsequent spino-pelvic harmony. However, the influence of specific cage factors has not been well studied. We focused on 3 parameters of these cages: (1) angle of the cage, (2) relative position in the disc space, and (3) the spinal level of cage placement. We quantified the gains in sagittal alignment using hyperlordotic cages and looked at the influence of these three parameters. This is a single center study from a prospective database of patients who underwent CMIS correction for ASD (Cobb angle > 20 degrees or SVA > 50 mm or PI/LL mismatch > 10) by the senior author from June 2012 to January 2016. Internal Review Board approval was obtained. Only patients with 2 or more levels fused were included. Indications for surgery included symptomatic back and/or leg pain attributed to ASD that was unresponsive to conservative measures. 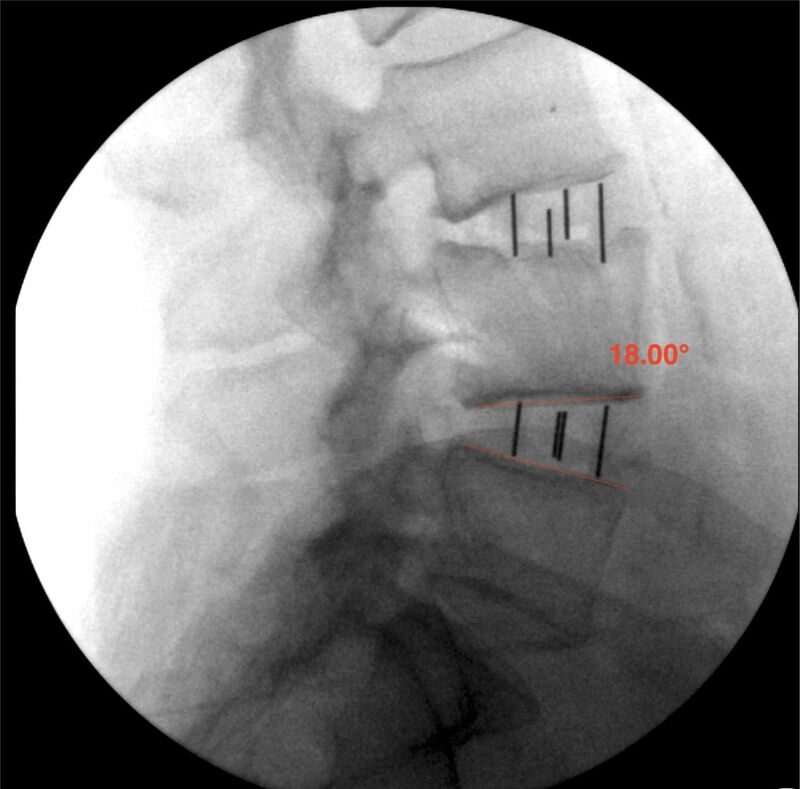 All patients were treated with MIS strategies using MIS Lateral Lumbar Interbody Fusion (LLIF) with percutaneous pedicle screw and rod instrumentation. Details of our techniques have been extensively published before.2,5,6,44-52 Patients were instrumented at each level with either a 6°, 10°, 12°, or 20° hyperlordotic cages. At L4-5 and L3-4, all patients had a 12° cage placed. At L2-3, patients had either a 6°, 10° or 12° degree cage based on the amount of sagittal correction needed. At L1-2 and T12-L1, usually a 6° or 10° cage was used. A few patients had ALL release and a 20° cage was used. At L5-S1 an ALIF was done. Patients who underwent posterior osteotomies were excluded from the study. 66 patients were identified who met the inclusion criteria. Radiographic measures were assessed using fulllength 36-inch radiographs at the time of enrollment and 6-week follow-up. Few patients had inadequate or unavailable 6-week follow-up, so earliest follow-up imaging was used. Segmental lordosis at each level was defined as the angle created by the upper end plate of the lower vertebrae and the lower end plate of the upper vertebrae. Regional lumbar lordosis was measured as the Cobb angle between the upper end plate of L1 and the upper end plate of S1. The position of the implant was decided by dividing the inferior vertebral body into three parts and the position was determined as to what third of the body the prosthesis predominantly occupied. Lumbar lordosis and segmental lordosis at pre op and post op for the entire patient pool was compared using T-testing. In 3 separate analyses, the data was stratified based on (1) lordotic angle of the cage, (2) relative position in the disc space, and (3) the spinal level of cage placement. For each of these parameters, mean pre op, post op, and delta segmental lordosis was calculated. Pre op values were compared to post op values using T-testing. Mean post op segmental lordosis was compared between groups in each parameter using ANOVA analysis. Statistical analyses were 2-sided and p < 0.05 was considered statistically significant. All statistical analysis was conducted using SPSS (Version 22). Table 1 shows demographic information. For the 66 patients who met inclusion criteria, the mean age was 66.08 (SD 8.22, Range 48-84). The mean number of levels fused with LLIF was 3.39 (SD 0.99, Range 2-5). A total of 224 cages were placed. Table 2 stratifies the total number of cages based on lordotic angle, relative position in the disc space, and spinal level of placement. Total number of cages stratified by lordosis, position, and spinal level. For the total patient pool, mean lumbar lordosis at pre op and at immediate post op was 39.43° and 49.32°, respectively. Table 3 shows mean segmental lordosis and lumbar lordosis figures for all cages placed in the study. Mean Segmental Lordosis and Global Lumbar Lordosis for Entire Cohort. Placement of 6°, 10°, 12°, and 20° cages yielded post op segmental lordotic angles of 9.00°, 13.09°, 13.23°, and 18.32°, respectively. Anteriorly, middle, and posteriorly placed cages produced 13.02°, 11.47°, and 8.23° of post op lordosis, respectively. Instrumentation at T12-L1, L1-L2, L2-L3, L3-L4, and L4-L5 translated to mean post op segmental lordotic values of 8.43°, 10.02°, 11.38°, 12.91°, and 14.58°, respectively. The mean post op values were statistically significant between all groups using ANOVA analysis. Moreover, all mean post op values were statistically significant compared to pre op figures. Tables 4-6 stratify pre op and post op segmental lordosis based on lordotic angle (Table 4), relative position in the disc space (Table 5), and spinal level of placement (Table 6). Figures reflect preoperative (Figure 1), intraoperative (Figure 2), and postoperative (Figure 3) radiographs of a patient who underwent CMIS correction with 2-level cage placement. Mean segmental lordosis grouped by lordotic angle of cage. Mean segmental lordosis grouped by relative position of cage in disc space. Mean segmental lordosis grouped by spinal level of cage placement. Preoperative sagittal image of lumbar spine before CMIS correction with hyperlordotic cages. Intraoperative fluoroscopy after placement of 12° cages at L3-4 and L4-5. Postoperative sagittal image of lumbar spine after 2-level cage placement. Segmental lordosis of 18° was achieved at L4-5. Achieving adequate correction in the sagittal plane has often been quoted as the most significant shortcoming of the CMIS philosophy; all the more important considering sagittal imbalance is the primary driver of clinical outcome in ASD patients.29-33 Mechanistically, excessive stress secondary to imbalance in the sagittal plane exhausts the posterior spinal muscles, translating to lower back pain.34,53,54We propose 3 augmenting strategies for CMIS correction of sagittal balance using hyperlordotic cages: (1) utilizing appropriately angled cages, (2) anterior positioning of the implant in the disc space, and (3) concentrating on lower level lumbar cage placement. In a review of 40 patients, Sembrano et al compared 10° lordotic cages to non-lordotic cages. The group found a significant increase in segmental lordosis at the operative level using 10° cages. However, overall lumbar lordosis remained unchanged. Anand et al.17 quantified the ceiling effects of CMIS correction in a prior study that included 0° and 6° cages done prior to 2011. In a retrospective study of 90 patients who underwent CMIS correction without osteotomies or ALL release, the study showed an SVA correction ceiling effect of 89 mm. Osteotomies were considered only when pre op SVA was greater than 100 mm and substantial lumbar lordosis was needed. In this study, using 6°, 10°, 12°, and 20° cages yielded post op segmental lordotic angles of 9.00°, 13.09°, 13.23°, and 18.32°, respectively. The data demonstrates a positive trend between instrumented cage angles and post op lordotic gains. Compared to each other, the post op lordotic angles are statistically significant (p < .05). Considering the findings, surgeons may elect to use increasingly lordotic cages when robust sagittal alignment is required. Nonetheless, there are important limitations in cage angle to consider. Extreme angled lordotic cages, including 20° and 30° cages, introduce certain mechanistic challenges by interrupting the natural curvature of the spine, point loading the endplate, and compromising contact between the cage-bone interphase.34 Moreover, gains in segmental lordosis reach a threshold as higher-level implants are eventually limited by the posterior elements of the vertebrae. Mirroring this point, the 20° cage in our study produced only 18.32° of lordosis post op. This is the only cage in our analysis that yielded a post op segmental measure shy of its known lordotic angle. Our study shows that a delta change on an average of 8.03° (Table 4) can be achieved with the 12° cages and this when done at each subsequent level results in a progressive harmonious creation of lordosis. We propose the 12° cage as the optimal compromise between lordotic gain and mechanistic challenge. When possible, placing the 12° cage anteriorly achieves significant lordosis that can be augmented beyond its known angle especially at L4-5 and L3-4. More importantly, it avoids the drawbacks of higher level 20° and 30° instrumentation such as anterior point loading. When considering multi-level fusions that require extreme correction in the sagittal plane we avoid fusion with exceedingly lordotic implants but rather perform multi-level instrumentation with the use of 12° cages to help achieve a harmonious correction that follows the natural curvature of the spine. Figures show a Circumferential MIS correction at preoperative (Figure 4) and postoperative (Figure 5) using 12° cages at each level. Preoperative XR imaging before placement of 12° cages for multilevel CMIS correction. Postoperative XR imaging after placement of 12° cages for multilevel CMIS correction. Between posterior, middle, and anterior placed cages there was a positive trend between post op segmental lordosis of 8.23°, 11.47°, and 13.02° with anterior placement. When compared to each other these figures were statistically significant on ANOVA (P < .05). Cages placed anteriorly demonstrated the highest mean delta at 8.36° (Table 5). Considering the phenomenon mechanistically, anteriorly placing the cage shifts the fulcrum of curvature along the disc space anteriorly and produces a cantilever effect. In our experience, this strategy provides a relatively easy and intuitive method of incrementally increasing sagittal gains. The level of cage placement also demonstrated significant trends with respect to segmental lordosis. Moving caudally, T12-L1, L1-L2, L2-L3, L3-L4, L4-L5 produced increasing post op lordotic angles of 8.43°, 10.02°, 11.38°, 12.91°, and 14.58°. These post op figures were statistically significant between groups on ANOVA. (P < .05) Considering such impressive gains, the L3-L4 and L4-L5 disc spaces are especially attractive targets for hyperlordotic cage instrumentation. Lower level instrumentation must be capitalized on to achieve harmonious instrumentation with as much correction as possible. Our data is limited in the number of posteriorly placed and higher 20° and 30° constructs. Further studies are needed to directly compare sagittal gains using lower level 6°, 10°, and 12° cages with these higher level angled implants. Also, whether the use of these augmenting strategies improves disability and overall clinical outcomes remains unknown. Our analysis was based on a 6-week radiographic follow-up window. Our results do not reflect the influence of future subsidence on the loss of segmental lordosis past this follow-up endpoint. Future studies with longer follow-up are required to quantify the effect of graft subsidence on overall correction. In our experience, current applications of interbody cages in CMIS correction underestimate the potential for sagittal correction. Specific augmenting strategies, including anterior placement of the cage in the disc space and lower level instrumentation can maximize segmental gains. We prefer 12° cages as an appropriate balance between lordotic gain and mechanistic limitation. Our overall strategy relies on multilevel instrumentation with anterior positioned 12° lordotic cages, providing a harmonious correction that follows the natural curvature of the spine. Along with rod contouring, these strategies can further eliminate the invasiveness of osteotomies, paving the way for truly minimally invasive methods of achieving sagittal correction. Neel Anand is a consultant for Medtronic and Theracell, on the scientific advisory board for Globus Medical, owns shares in Medtronics, Globus Medical, Paradigm Spine, Theracell, Atlas Spine, and receives royalties from Globus Medical, Medtronic, and Elsevier. Eli Baron receives royalties from Elsevier and McGraw-Hill. The other authors declare no relevant financial disclosures or conflicts of interest. (2014) Is circumferential minimally invasive surgery effective in the treatment of moderate adult idiopathic scoliosis? Clinical Orthopaedics and Related Research® 472(6):1762–1768. (2013) Long-term 2- to 5-year clinical and functional outcomes of minimally invasive surgery for adult scoliosis. Spine 38(18):1566–1575. (2010) Minimally invasive surgery for thoracolumbar spinal deformity: initial clinical experience with clinical and radiographic outcomes. Neurosurgical focus 28(3):E9. 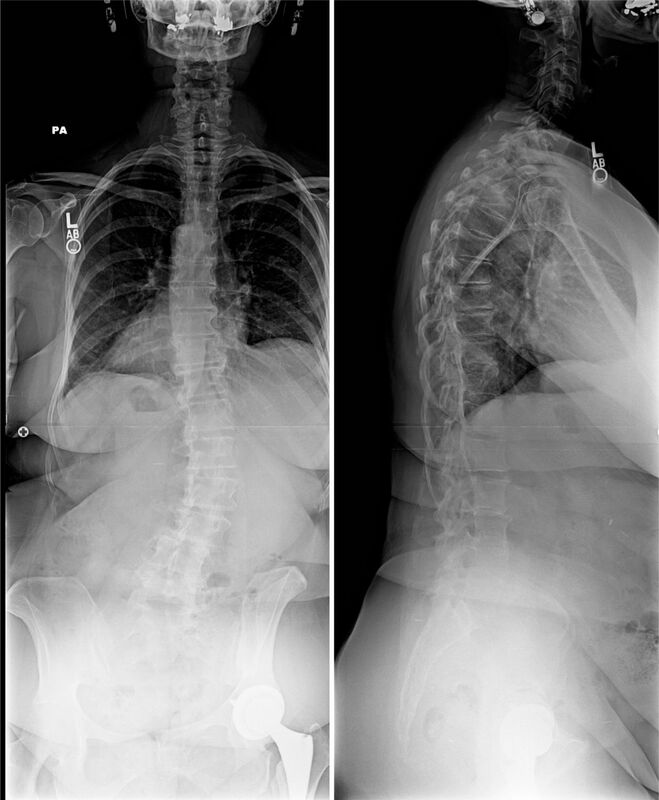 (2010) A prospective, nonrandomized, multicenter evaluation of extreme lateral interbody fusion for the treatment of adult degenerative scoliosis: perioperative outcomes and complications. Spine 35(26 Suppl):S322–330. 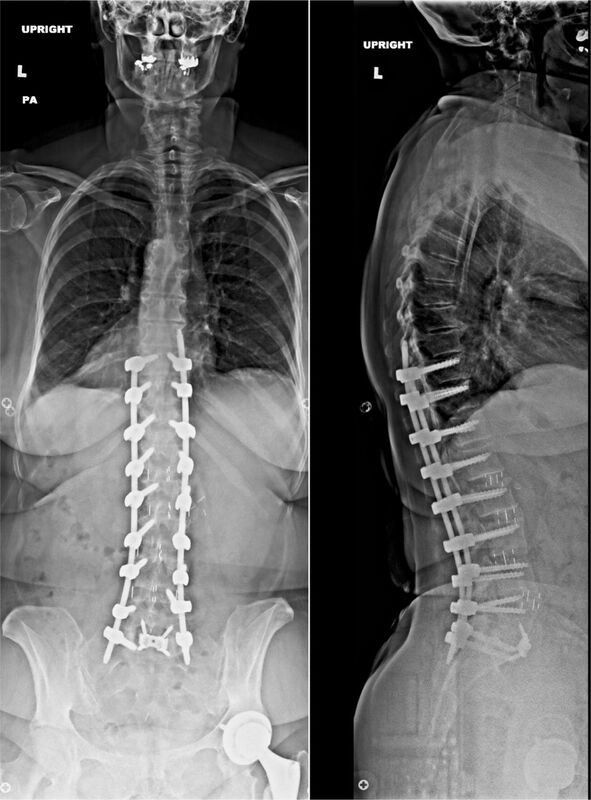 (2010) Mid-term to long-term clinical and functional outcomes of minimally invasive correction and fusion for adults with scoliosis. Neurosurgical focus 28(3):E6. (2008) Minimally invasive multilevel percutaneous correction and fusion for adult lumbar degenerative scoliosis: a technique and feasibility study. Journal of spinal disorders & techniques 21(7):459–467. (2007) Comparison of one-level posterior lumbar interbody fusion performed with a minimally invasive approach or a traditional open approach. Spine 32(5):537–543. (2003) Minimally invasive lumbar fusion. Spine 28(15 Suppl):S26–35. (2002) Minimally invasive percutaneous posterior lumbar interbody fusion. Neurosurgery 51(5 Suppl):S166–181. (1999) Laparoscopic fusion of the lumbar spine: minimally invasive spine surgery. A prospective multicenter study evaluating open and laparoscopic lumbar fusion. Spine 24(4):402–411. (2014) Complications associated with the initial learning curve of minimally invasive spine surgery: a systematic review. Clinical orthopaedics and related research 472(6):1711–1717. (2013) Learning curve for percutaneous endoscopic lumbar discectomy depending on the surgeon's training level of minimally invasive spine surgery. Clinical neurology and neurosurgery 115(10):1987–1991. (2015) Comparison of two minimally invasive surgery strategies to treat adult spinal deformity. Journal of neurosurgery Spine 22(4):374–380. (2014) Less invasive surgery for treating adult spinal deformities: ceiling effects for deformity correction with 3 different techniques. Neurosurgical focus 36(5):E12. (2014) Comparison of radiographic results after minimally invasive, hybrid, and open surgery for adult spinal deformity: a multicenter study of 184 patients. Neurosurgical focus 36(5):E13. (2013) Minimally invasive lateral approach for adult degenerative scoliosis: lessons learned. Neurosurgical focus 35(2):E4. (2014) Limitations and ceiling effects with circumferential minimally invasive correction techniques for adult scoliosis: analysis of radiological outcomes over a 7-year experience. Neurosurgical focus 36(5):E14. (2015) Pedicle subtraction osteotomies (PSO) in the lumbar spine for sagittal deformities. European spine journal : official publication of the European Spine Society, the European Spinal Deformity Society, and the European Section of the Cervical Spine Research Society 24(Suppl 1):S49–57. (2006) Decision making regarding Smith-Petersen vs. pedicle subtraction osteotomy vs. vertebral column resection for spinal deformity. Spine 31(19 Suppl):S171–178. (2004) Pedicle subtraction osteotomy for the treatment of fixed sagittal imbalance. Surgical technique. The Journal of bone and joint surgery American volume 86-A(Suppl 1):44–50. (2005) Comparison of Smith-Petersen versus pedicle subtraction osteotomy for the correction of fixed sagittal imbalance. Spine 30(18):2030–2037, discussion 2038. (2008) Corrective osteotomies in spine surgery. The Journal of bone and joint surgery American volume 90(11):2509–2520. (2012) Sagittal realignment failures following pedicle subtraction osteotomy surgery: are we doing enough? : Clinical article. Journal of neurosurgery Spine 16(6):539–546. (1999) Serial changes in trunk muscle performance after posterior lumbar surgery. Spine 24(10):1023–1028. (1996) Back muscle injury after posterior lumbar spine surgery. A histologic and enzymatic analysis. Spine 21(8):941–944. (1996) Back muscle injury after posterior lumbar spine surgery. Topographic evaluation of intramuscular pressure and blood flow in the porcine back muscle during surgery. Spine 21(22):2683–2688. (1998) The effects of external compression by three different retractors on pressure in the erector spine muscles during and after posterior lumbar spine surgery in humans. Spine 23(3):354–358. (2014) The minimally invasive spinal deformity surgery algorithm: a reproducible rational framework for decision making in minimally invasive spinal deformity surgery. Neurosurgical focus 36(5):E6. (2014) Minimally Invasive Spinal Deformity Surgery, Multilevel TLIF for Spinal Deformity (Springer), pp 173–183. (2014) Minimally Invasive Spinal Deformity Surgery, Sagittal Balance (Springer), pp 33–37. (2013) Prediction of sagittal balance in patients with osteoporosis using spinopelvic parameters. European spine journal : official publication of the European Spine Society, the European Spinal Deformity Society, and the European Section of the Cervical Spine Research Society 22(5):1053–1058. (2005) The impact of positive sagittal balance in adult spinal deformity. Spine 30(18):2024–2029. (2005) Correlation of radiographic parameters and clinical symptoms in adult scoliosis. Spine 30(6):682–688. (2015) Finite element analysis of lordosis restoration with anterior longitudinal ligament release and lateral hyperlordotic cage placement. European spine journal : official publication of the European Spine Society, the European Spinal Deformity Society, and the European Section of the Cervical Spine Research Society 24(Suppl 3):420–426. (2014) Minimally Invasive Spinal Deformity Surgery, The Importance of the Fractional Curve (Springer), pp 47–52. (2014) Management of sagittal balance in adult spinal deformity with minimally invasive anterolateral lumbar interbody fusion: a preliminary radiographic study. Journal of neurosurgery Spine 20(5):515–522. (2014) Anterior column realignment (ACR) for focal kyphotic spinal deformity using a lateral transpsoas approach and ALL release. Journal of spinal disorders & techniques 27(1):29–39. (2012) Lordosis restoration after anterior longitudinal ligament release and placement of lateral hyperlordotic interbody cages during the minimally invasive lateral transpsoas approach: a radiographic study in cadavers. Journal of neurosurgery Spine 17(5):476–485. (2012) Anterior longitudinal ligament release using the minimally invasive lateral retroperitoneal transpsoas approach: a cadaveric feasibility study and report of 4 clinical cases. Journal of neurosurgery Spine 17(6):530–539. (2012) Early outcomes of minimally invasive anterior longitudinal ligament release for correction of sagittal imbalance in patients with adult spinal deformity. TheScientificWorldJournal 2012:789698. (2012) Sagittal alignment correction and reconstruction of lumbar post-traumatic kyphosis via MIS lateral approach. European spine journal : official publication of the European Spine Society, the European Spinal Deformity Society, and the European Section of the Cervical Spine Research Society 21(12):2718–2720. (2015) Posterior-only spinal release combined with derotation, translation, segmental correction, and an in situ rod-contouring technique for treatment of severe and rigid scoliosis. Journal of neurosurgery Spine 22(2):194–198. (2015) Influence of Rod Contouring on Rod Strength and Stiffness in Spine Surgery. Orthopedics 38(6):e520–523. (2012) Role of dynesys as pedicle-based nonfusion stabilization for degenerative disc disorders. Advances in orthopedics 2012:218385. (2013) Urological injury as a complication of the transpsoas approach for discectomy and interbody fusion. Journal of neurosurgery Spine 18(1):18–23. (2013) Minimally invasive approaches for the correction of adult spinal deformity. European spine journal : official publication of the European Spine Society, the European Spinal Deformity Society, and the European Section of the Cervical Spine Research Society 22(Suppl 2):S232–241. (2007) Benefits of the paraspinal muscle-sparing approach versus the conventional midline approach for posterior nonfusion stabilization: comparative analysis of clinical and functional outcomes. SAS journal 1(3):93–99. (2008) Modified muscle-sparing paraspinal approach for stabilization and interlaminar decompression: a minimally invasive technique for pedicle screw-based posterior nonfusion stabilization. SAS journal 2(1):40–42. (2014) Evidence basis/ outcomes in minimally invasive spinal scoliosis surgery. Neurosurgery clinics of North America 25(2):361–375. (2014) Is circumferential minimally invasive surgery effective in the treatment of moderate adult idiopathic scoliosis? Clinical orthopaedics and related research 472(6):1762–1768. (2014) Does minimally invasive transsacral fixation provide anterior column support in adult scoliosis? Clinical orthopaedics and related research 472(6):1769–1775. (2006) Cantilever TLIF with structural allograft and RhBMP2 for correction and maintenance of segmental sagittal lordosis: long-term clinical, radiographic, and functional outcome. Spine 31(20):E748–753. (2009) Sagittal plane considerations and the pelvis in the adult patient. Spine 34(17):1828–1833. (1992) Diagnostic findings in painful adult scoliosis. Spine 17(5):518–527. (2014) Adult Spinal Deformity: Sagittal Imbalance. International Journal of Orthopaedics 1(3). (1969) Osteotomy of the spine for correction of flexion deformity in rheumatoid arthritis. Clinical orthopaedics and related research 66:6–9. (2013) Osteotomies/spinal column resections in adult deformity. European Spine Journal 22(2):254–264. (2011) Rates of new neurological deficit associated with spine surgery based on 108,419 procedures: a report of the scoliosis research society morbidity and mortality committee. Spine 36(15):1218–1228. (2011) Short-term morbidity and mortality associated with correction of thoracolumbar fixed sagittal plane deformity: a report from the Scoliosis Research Society Morbidity and Mortality Committee. Spine 36(12):958–964. (2011) Riskbenefit assessment of surgery for adult scoliosis: an analysis based on patient age. Spine 36(10):817–824. (2011) Rates of infection after spine surgery based on 108,419 procedures: a report from the Scoliosis Research Society Morbidity and Mortality Committee. Spine 36(7):556–563. (2007) Complications in posterior fusion and instrumentation for degenerative lumbar scoliosis. Spine 32(20):2232–2237. (2007) Adult spinal deformity surgery: complications and outcomes in patients over age 60. Spine 32(20):2238–2244.